I got about 60 1 minute subs @ 100mm f8. I had a clear night filter by Haida as my LP is terrible just east of Toronto. I’m guessing no nebulosty as the filter may have blocked it? Or the moon was washing everything out. Not a cloud in the sky tonight. Stacked in DSS. I didnt bother with flats, bias and darks as I was just testing things. Any ideas guys? My guess is that it’s not the LP filter’s fault, but a combination of too short exposure time for each sub, and too short total integration. Edited by fmeschia, 18 March 2019 - 11:46 PM. Try dithering and make sure the histogram is between 20 to 25%. Can you get several hours of Light subs? Don't forget BIAS, Flats and Darks. Have you tried without the LP filter? Edited by Jim Waters, 18 March 2019 - 11:42 PM. What image are you referring to? I don’t see any image in the OP’s message. I didnt post an image. Edited by 17.5Dob, 19 March 2019 - 12:37 AM. Precisely. So, no wonder that with 1 hr total integration, under LP, and with a less favorable f-stop, there was no nebulosity to be seen. Edited by fmeschia, 19 March 2019 - 12:41 AM. Just to point out that most of the M45 nebulosity is "almost" white with a shift towards blue. So LP filters are as ineffective as when imaging galaxies. To make things worse, some LP filters like the CLS pass no blue at all! So just shoot loads of Integration Time using no filter. 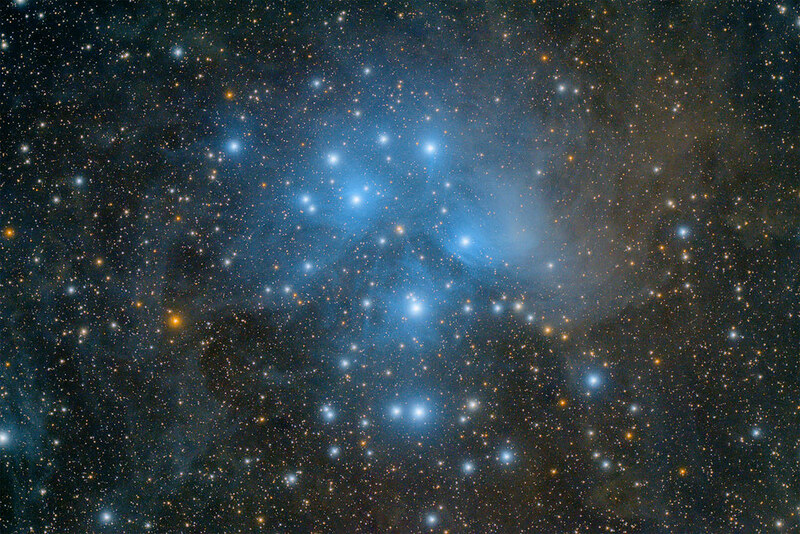 At a dark site 3 hours ought to give a decent image of M45, but of course 6 hours will be better At a suburban site next to a large city the light pollution is normally between 15x to 40x that at a dark site. Hence to get similar quality images you will need to extend the IT by 15x to 40x. To measure your local light pollution and gauge whether you should bother with shooting galaxies and bluish nebulae from your home base just follow the instructions here. Imaging at suburban sites is much more satisfying if you use a modded camera and chase red nebulae using Narrowband filters. LP filters work well in semi-rural suburbia where you can "just" make out the Milky Way by naked eye. If you cannot, just go all the way, modded camera+Narrowband, and of course, lunar/planetary. There is always something to play with, even downtown Singapore as Christopher Go has shown us with his world class planetary images. Here's a single 60-second sub from an un-modded Canon T3i (ISO 800) at f/5.9. 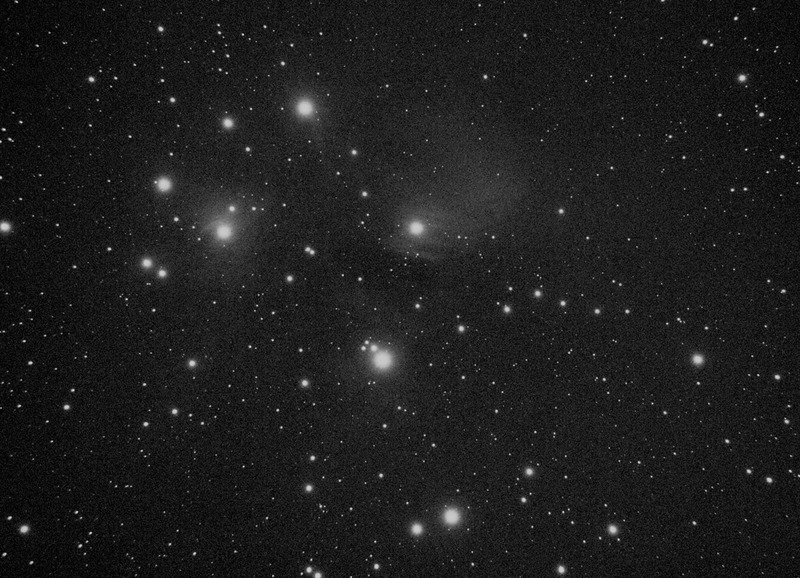 Part of the grayscaled-stack I'm using to create a master luminance, stretched to show there's nebulosity there. I live in Bortle 3-4 skies. Edited by OldManSky, 20 March 2019 - 11:25 AM.